Well, a few “presents for Yui” packages arrived and I just couldn’t resist posting about them! My girl Yui got to try on a new outfit from Iplehouse as well as a wig and pair of shoes from Leeke World. The Iplehouse outfit has a sort of bad-girl look to it which I have a bit of a weakness against ^^; It was designed for Iplehouse’s YID Girl doll series, but fits pretty well for DD as you can see. The outfit comes in 3 pieces: The “What’s love got to do with it?” top, pleated print skirt, and lovely stripped socks. The top is a bit loose on little Yui though. If she had an M or L bust, I think it would fit very nicely, but even with her default S bust, it looks pretty good. Quite fittingly, the top comes with a cute music note ornament for our clumsy little rock-star. Too bad the outfit is primarily dark colors with black threading. I had to remove the outfit quickly after shooting these pics in order to avoid staining Yui. I wish I could leave it on her! 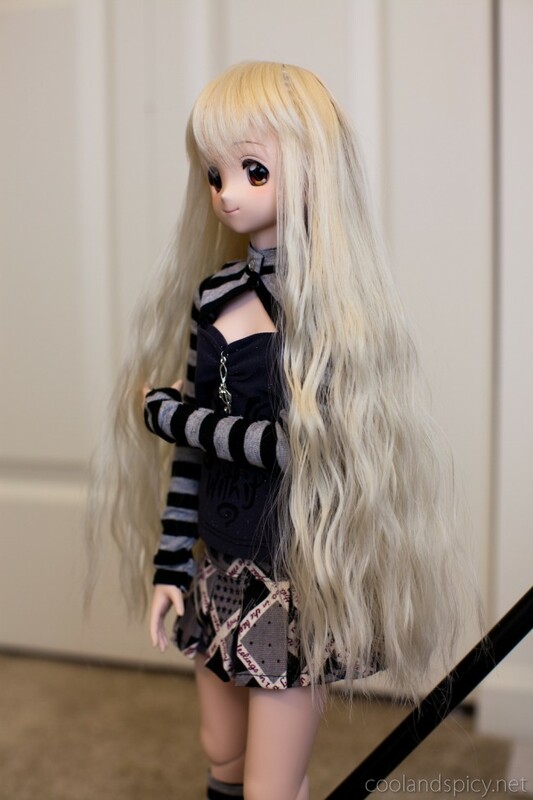 Along with the new outfit, Yui received a new wig. What do you think? Long, wavy blond hair is cute ^^. It wasn’t my intention but she kind of looks like Mugi-chan, doesn’t she? Complete look at the wig. Leeke World makes nice wigs! .-= mefloraine´s last post… Enjoying Aria =-. Well, not exactly, but still has her face. 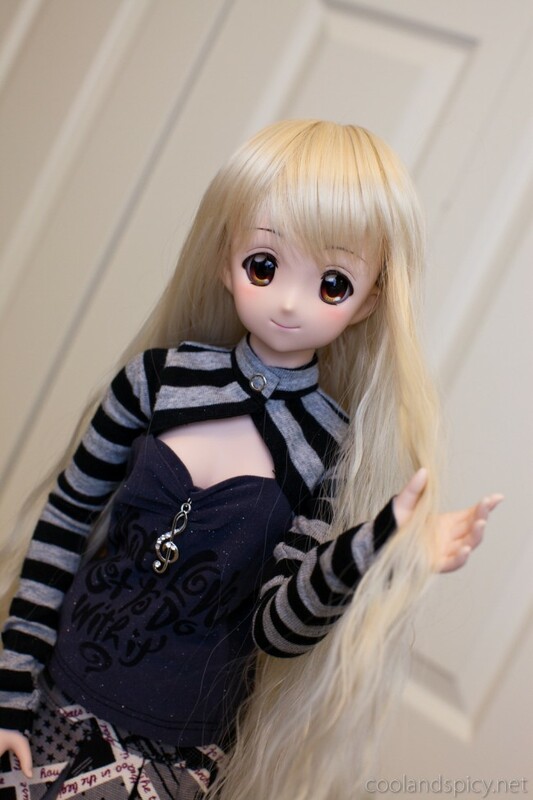 That is the cutest outfit <3 The wig does remind me of Mugi, though! I'm loving the matching socks & sleeves. .-= Mint´s last post… Angel Beats 4 =-. 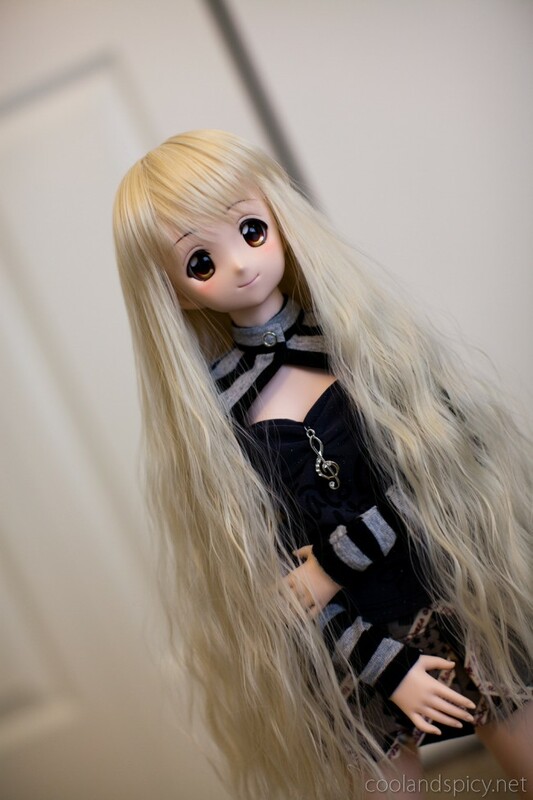 Like the new wig as well, the sudden impression of seeing Mugi is uncanny. 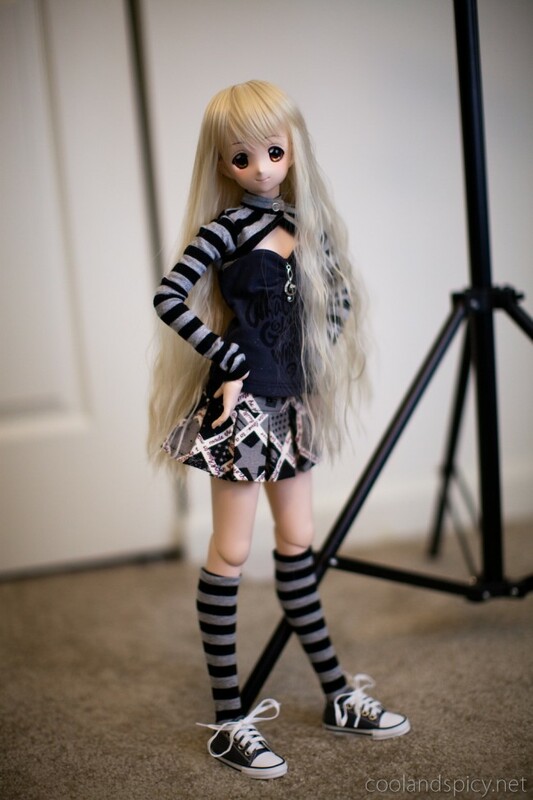 Maybe this is what Mugi may look like if Volks creates a DD of her? Am tempted to also try other wigs on Yoko, actually have been advised to get her a ‘daily’ wig as the default Yoko wig is hard to maintain and apparently fragile. But I love its look, redhead sidebangs and ponytail FTW. Handy about this Leeke wig seems to be that due to the long wavy hair, it doesn’t immediately ruin the look if it’s a bit undone with a few strands sticking out. .-= Smithy´s last post… Shin Koihime†Musou Otome Tairan 4 =-. The colour of her eyes and the hair tone do go really well together! .-= TAKET0MB0´s last post… Abode =-. 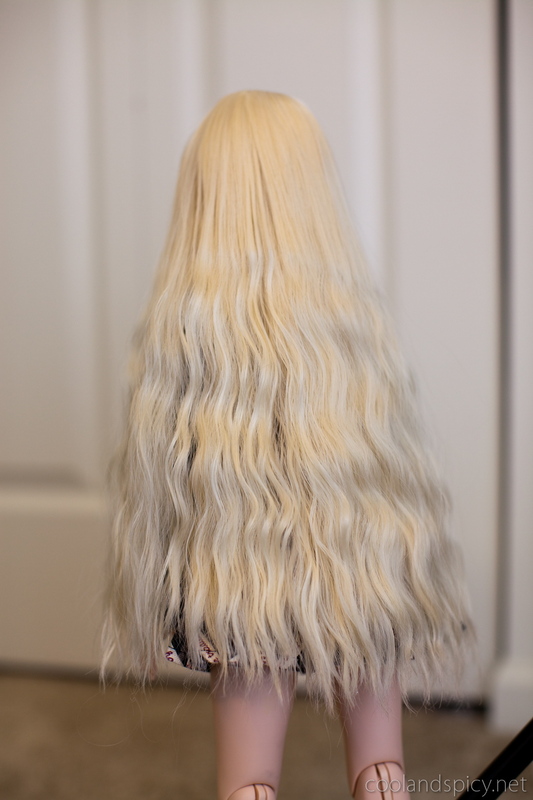 That wig really looks especially nice from behind. .-= lovelyduckie´s last post… Zack and Wiki (Wii) =-. Nice/cute clothes…except the music not on the chest , i feel its a bit too much. .-= Fabrice´s last post… Golden Week in Japan =-. .-= Yi´s last post… The Dolls of Kimi ni Todoke =-. if i got the yui DD i would just “customize” her because her face is so dam cute!!!!!!!!!!!!!! what size of shoes did u get yui? Those are Leeke World’s L-Girls(6.7cm) shoes. They fit very nicely on Yui. what size of shoes from leeke world fits a DD? of info in such a perfect approach of writing? I’ve a presentation next week, and I’m at the look for such information.